Water features add the relaxing sound and movement of water to help create a peaceful oasis in your home. But algae growth inside a garden fountain makes crystal-clear water appear green and dirty, turning that peaceful retreat into a messy maintenance issue. The algae can eventually clog the fountain's filter. A little cleaning and maintenance along with a natural algaecide for fountains can help get the unwanted green growth under control. What makes algae grow in your fountain? It's a combination of water and light. Lots of little particles, debris and contaminants in the water are nutrients for algae. With the addition of light, the algae can grow. So if your fountain sits in a spot with hours of direct sunlight each day, there's a higher chance of algae growth. Removing very light algae growth does not require completely dismantling the fountain and cleaning it thoroughly. In some cases, you can simply wipe the algae from the inside the fountain basin, allowing the water and loose algae debris to run through the fountain filter. Use a cleaning cloth or a sponge with a mild abrasive to wipe away the algae. If the water appears especially dirty after you knock the algae loose, you may wish to replace that water with fresh water. Although this light cleaning routine leaves the fountain basin clean, the algae builds up in the filter, which will eventually require a deeper cleaning. If your algae problem is a little more extensive, you may need to do a deep clean. Unplug the fountain's filter, and set it aside. Empty the water from the fountain, either by tilting the fountain, siphoning the water or pumping out the water. Scrub the fountain basin with hot, soapy water made with a mild dish detergent. A solution of diluted bleach with one part bleach to nine parts water can help kill and prevent algae. But use bleach with caution because it can be toxic to kids and animals. Another option is to use a mix of white vinegar and water. Vinegar is safe and is effective on algae. Rinse the fountain thoroughly after cleaning it. If you use a commercial fountain cleaner, make sure it's safe for the material in your fountain. Some cleaners can damage the fountain material. Submerge the fountain filter but not the filter motor in hot, soapy water, and scrub it clean with a scrub brush. Use the pressure from running water to dislodge debris stuck on the filter. Soak the tubes in a vinegar and water solution for several hours or overnight to remove algae from them. Algae is photosynthetic and thrives on sunlight, although it doesn't grow leaves or have roots like plants in a garden. Without sunlight, algae can't grow. So the easiest way to prevent algae in your fountain is to place it in shade. If you don't have a shady corner or location under a shade tree for the fountain, then place it near an arbor or similar structure that blocks sunlight. If your fountain has a light, shut it off at night. The prolonged exposure to light can add to the algae growth. Impurities in water also lead to algae in a fountain. 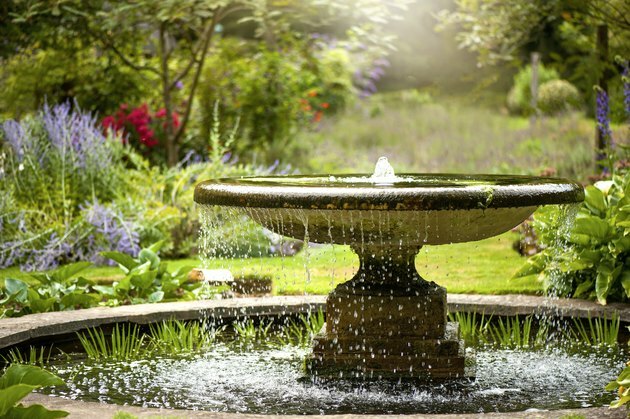 Avoid filling your fountain with contaminated water, such as unfiltered water from a pond or stream. Instead, use treated tap water or distilled water from which all impurities were removed. This is especially helpful in an indoor water feature where you don't have to worry about rainwater or outdoor contaminants getting into the water. You can also use additives in your fountain water to minimize algae growth. Garden centers sell a range of algae-prevention products, known as algaecides, for pools, ponds and fountains. These products can kill algae already present in the water or keep it from growing in clean water. Keep in mind that harsh chemicals can be dangerous to wildlife and humans, so choosing a natural algaecide for fountains is the safest option. Application instructions vary among the products and vary with fountain size. Algaecide is generally used for a fountain by first diluting the product with water, usually 1 part algaecide to 4 parts water, and pouring the diluted solution into the fountain at a spot near its pump. The water becomes foamy as the algaecide begins working against algae, but it eventually becomes crystal clear. Household bleach mixed with fountain water can be an effective homemade algaecide when neither plants nor other aquatic life live in the fountain, but bleach is generally not recommended because it can damage the fountain's material. It's also potentially dangerous for animals drinking from the fountain or kids who might play in the water. An alternative DIY algaecide option is to add oxygen bleach to the water, which doesn't have the toxic ingredients of chlorine bleach. If you use a powdered oxygen bleach, dissolve it completely in water before adding it to the fountain. Regular fountain cleaning should keep algae to a minimum. If you have regular algae growth, a simple commercial or DIY algaecide can do the trick to stop or slow the growth so you can enjoy clear fountain water.